The jockey merry-go-round for enigmatic galloper Tom Melbourne continues with Melbourne Cup winning jockey Corey Brown getting the call up in the Group 2 $358,000 Attwood Marshall A.D. Hollindale Stakes (1800m) at the Gold Coast today. Tom Melbourne, above in blue and gold hoops and white sleeves, will be ridden by Corey Brown in the A.D. Hollindale Stakes at the Gold Coast. Photo by Steve Hart. Brown takes over the reins from Kerrin McEvoy who has been aboard Tom Melbourne in his two most recent outings for a fifth to Happy Clapper in the Group 1 $3m The Star Doncaster Mile (1600m) at Randwick on April 7 and an eighth to Trapeze Artist in the Group 1 $600,000 Schweppes All Aged Stakes (1400m) at Randwick a fortnight later. Tom Melbourne has been placed eleven times since he last greeted the judge first with a win in the 2016 Listed $170,000 Albury Gold Cup (2000m) at Albury and has also performed well at Group 1 level with three placings. The Chris Waller trained seven year old has had an array of top class riders on board but they have been unable to get him to find the winner’s stall in over two years. Damien Oliver and Glenn Boss have been Group 1 placed on Tom Melbourne while Blake Shinn and Michael Walker have been runner up on the European import on two occasions. Terry Henderson of OTI Racing, which part-owns the former Irish stayer, is hoping that the Corey Brown magic might be able to break his losing stint. “Let’s hope Corey is the one that can get it done,” Henderson told racing.com. 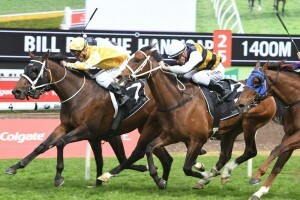 “He looks well placed and Chris Waller seems confident – or as confident as you can be with Tom Melbourne. It’s not a particularly deep race and he’s drawn a barrier to stay out of trouble. Waller will saddle up five runners in the A.D. Hollindale Stakes, including Comin’ Through who Tom Melbourne ran second to, three starts back with Blake Shinn abaord, in the Group 2 $200,000 Hyland Race Colours Ajax Stakes (1500m) at Rosehill on March 17. Betting at Ladbrokes.com.au for the A.D. Hollindale Stakes has Comin’ Through marked as the $2.90 favourite while Tom Melbourne is the third pick at $5 just behind the James Cummings trained It’s Somewhat at $4.60. Waller’s other runners are Egg Tart at $9, Satono Rasen at $17 and One Foot In Heaven at $21.